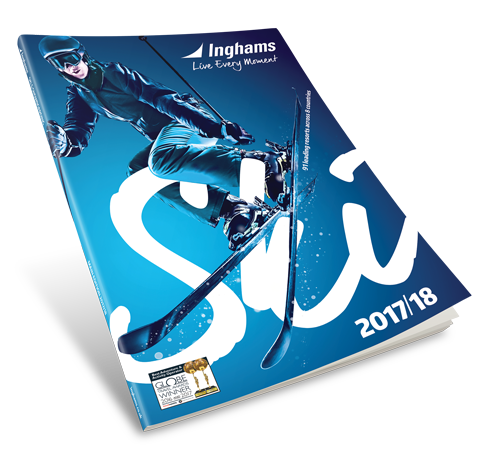 New Inghams Ski & Snowboarding Main Edition 2017/18 brochure. This month, Inghams has launched its Ski 17/18 main edition brochure with FOUR NEW RESORTS and a range of MONEY SAVING DEALS, including a £40 discount per couple on all holidays. The new brochure, which features 91 resorts across eight countries and departures from 21 UK airports, offers plenty of choice for the coming winter season. Holiday options are flexible, with an extended programme of short ski breaks to selected resorts in Switzerland, France and Austria available, as well as inclusive ski holidays from £759 per person to Kühtai in Austria, Flaine, Montgenèvre, Morzine and Les Menuires in France, and Arinsal in Andorra. Inghams has also added a range of new partner hotels across its ski programme, including in Tignes (France), Selva (Italy), Saas Fee (Switzerland), and Zell am See (Austria). New for the 17/18 ski season, Chalet Linda in Kitzbühel, Austria, will join Inghams’ popular chalet programme. Sleeping 28 – 37 guests, Chalet Linda is located just five minutes' walk from the Hahnenkamm Gondola and ski school meeting point in the world-renowned resort of Kitzbühel, which boasts an excellent range of skiing for all to enjoy. Inghams is offering a seven night holiday on a catered board basis (including buffet breakfasts, afternoon tea and cake, and three-course evening meals with complimentary wine for six days) at the three-diamond Chalet Linda in Kitzbühel, Austria, from £695 per person, based on two sharing. Price includes return flights from London Gatwick to Innsbruck and airport transfers. The package is valid for travel departing on 6th January 2018. To book, visit www.inghams.co.uk/ski-holidays or call 01483 791 114. In addition to the above unbeatable offers, Inghams’ cast iron Lift Pass price guarantee remains, meaning guests who pre-book their lift passes in the UK will not lose out. For bookings, please visit www.inghams.co.uk, call 01483 791 116 or follow @inghamsholidays. For PR enquiries, please contact Frankie Gibson, PR Executive, on frankie.gibson@inghams.co.uk or call 01483 791 045.